With Salt Lake Acing Company currently running one of its biggest seasons to date, you could almost swear the company was running full-time at this point. --- So far, its opener, Bloody Bloody Andrew Jackson, has received rave reviews and played to sold-out shows almost every night, stirring up the local acting community and giving hope for more musicals on the way next year. 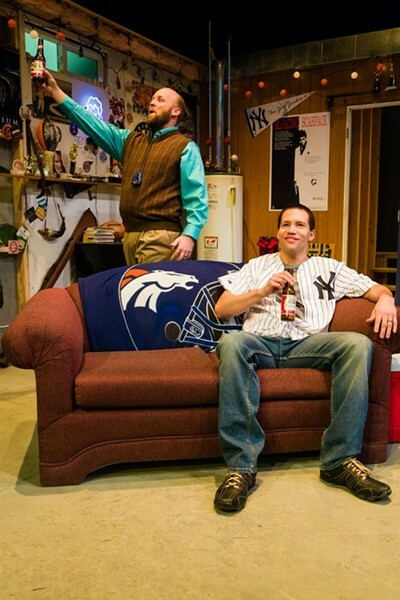 But, next on the docket is a simplified play, Manning Up, with two men who examine their lives as they become first-time dads. Lanny: I am originally from Toquerville, an awesome town in the red hills of southern Utah near Zion National Park, where tourists get busted for smoking pot every summer because they think it’s funny to “toke up” in Toquerville. I’m married, and have an almost-six-year-old daughter, and a baby on the way -- which was kind of serendipitous, given the content of the play! I just moved here over the summer from Moscow, Idaho, where I was in graduate school, so this is my first professional play in Salt Lake. Perry: I grew up in Utah, but moved to Chicago after my theater training at the University of Utah. I've been back for a couple of years now because I missed having every business closed on Sundays so darn much -- it's so great being back. Seriously, though, I've loved being back here not only for the landscape, and my family, but the artistic community, as well. Gavin: How did each of you become involved with theater, and how did find your way to SLAC? Lanny: I didn’t start doing theater until college. I thought that people who did theater were kind of freaks. But, as a geology major, I was taking a curriculum-required Shakespeare class that I enjoyed enough that on a whim I decided to try out for a production of Shakespeare’s The Tempest. I was cast as Stephano, and got hooked. I recently graduated from the University of Idaho with an MFA in acting. Many years ago, I saw a production of Kimberly Akimbo at SLAC that I LOVED, and when I moved back to Utah, I made sure to get on their mailing list so I’d know when they had auditions. So when I received an audition notice for this play, I was all over it. 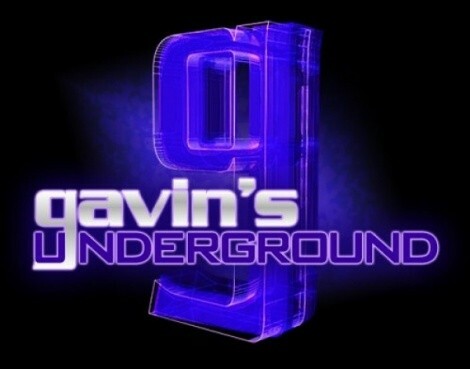 Gavin: Tracy, how did you first come across Manning Up, and what were your initial thoughts on the production? Tracy: I was introduced to Manning Up when Keven called me and asked me about directing. My initial thoughts were that this is a very warmhearted and unique way of looking at how a man feels as he is about to go through the most important lifestyle change possible. We don’t really hear much about the expectant father’s fears, doubts and joys, or the overwhelming feeling that you are going to be the most important role model for another human being. It is refreshing and funny! Gavin: How did you end up in the director's chair for this play at SLAC, and what is it like for you to take on that role with this specific play? Tracy: Well, I begged and pleaded. No, not really but I do like working with everyone at SLAC. It is my kind of theater and my kind of loyal and open-minded audience. I usually send a note to Cynthia and Keven letting them know I am interested in being considered for the next season and my schedule at Weber, and if they think I might be suited to a production, we talk about it. I am always happy when it works out. Gavin: This play kind of falls in the same field Red found itself last year, being just a two-man play, which isn't very common for SLAC. What challenges did this present for you directing it and helping bring it to life? Tracy: Well, a two-person play has its own challenges -- casting well is always so important, but the connection between actors in a small cast is essential to making the dramatic action work. Lanny and Jesse have been very open to the way I like to work. We spent a lot of time in the rehearsal exploring and experimenting; they are very different from each other on many levels but also complement each other beautifully. It has been a fun process in the Man Cave! 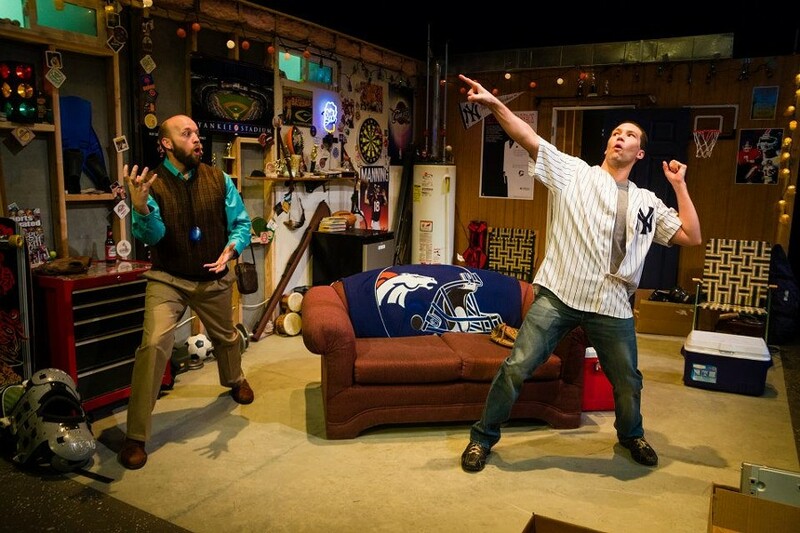 Gavin: Lanny and Jesse, when did you each first find out about the play, and what were your thoughts on it after reading it? Perry: I belly laughed A LOT the first time I read this play. 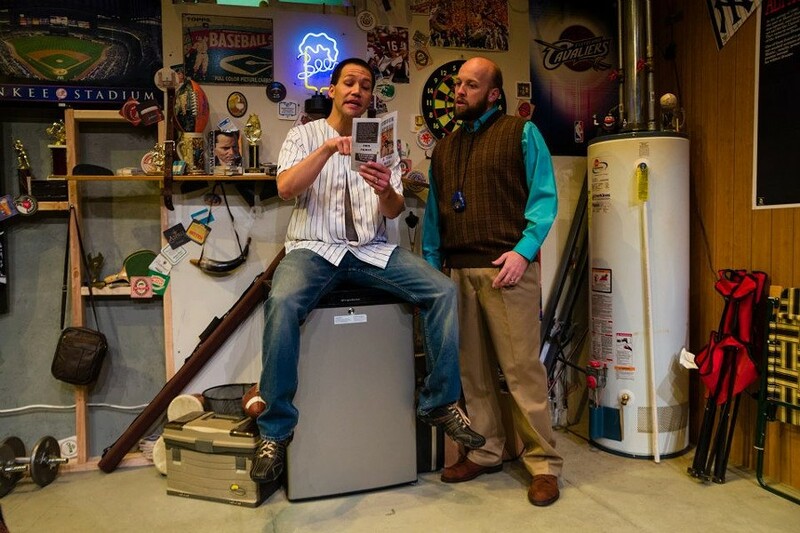 Comedy comes out of truth, and the playwright, Sean Christopher Lewis, does an incredible job of pulling thoughts out of both of these characters that I'm sure every man has grappled with. How has the idea of masculinity changed over the past few decades? How do I calibrate my identity and my role within a relationship, within a family? What are my uncertainties and fears -- and, for God's sake, do other men have them? Lanny: Since this is a world premiere, I didn’t know anything about it, which is always fun as an actor. I loved this script from day one, though. 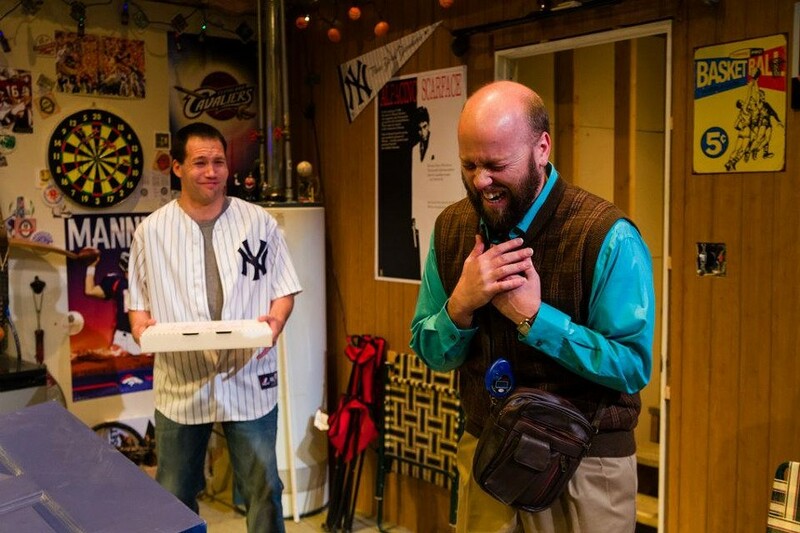 When I read the script before auditioning I kept thinking, “Man, I have a lot in common with Donnie!” So, I was really excited to audition for the play. Gavin: What was it like for both of you auditioning and eventually getting your parts? Lanny: The auditions were a lot of fun. I’m usually pretty nervous when I audition, but the people at SLAC are so kind, and really good at helping actors feel at ease when they come in to read for a part. I felt like I did a good job at the initial audition, and at the callbacks I had the opportunity to read with some top-notch actors and we all had a lot of fun reading together. The whole process was the most fun I’ve had auditioning in a while. When Keven called me to tell me they were casting me, I screamed a little bit on the phone. It was slightly embarrassing, but I couldn’t hold it in. Perry: During the callback audition, Tracy would throw some ideas out there for us to work with like, "Let's play with the stereotype of what a 'man' is, and then deconstruct that, find something genuine." That part of the process alone has been exhilarating -- and hilarious. Gavin: How has it been for you both fitting into these roles and interacting with each other? Perry: Lanny's great. I couldn't have asked for a better counterpart to tell this story. We both get who these guys are, and we're having a blast living in their shoes, sharing their hopes and fears. Believe it or not, Lanny's actually got a baby on the way and I'm finding myself rooting for him just the way my character would! Lanny: I have a lot in common with Donnie, so fitting into this role has been as much about self-discovery as discovery about my character. I share a lot of Donnie’s worries about whether or not he’s going to be a good dad, and a good husband. And with a new baby on the way, I’m re-experiencing a lot of the anxiety I had before my daughter was born, so it is a very parallel journey to what is happening in the play -- very a much a case of “art imitating life." When Jesse and I were auditioning, I had a great time reading with him, so I was happy when I learned I’d be working with him. There are some actors who are just easy to work with, and Jesse is definitely one of those. Gavin: Considering that it's just the two of you, does it present more of a challenge that you have to play off each other more without an ensemble of characters, or do you find it easier with the two-man back-and-forth? Lanny: It’s actually been really nice to just have Jesse. We got used to each other’s rhythms really quick. Even as far back as auditions, our energies just seemed to click. I’ve never done a two-man show before, so I don’t have anything to compare it to, but if they’re all like this, I’ll definitely be down in the future. Perry: When an actor analyzes a script, he's looking for the many moments of transformation in his character throughout the play. 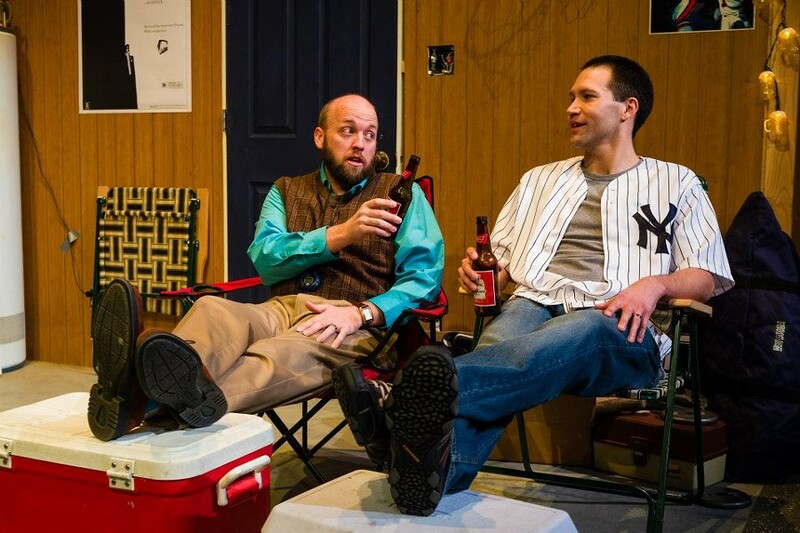 Doing a two-man show can be like acting with a larger ensemble because the other person on stage -- as the play progresses -- is constantly becoming somebody else or, rather, revealing who they really are. My character has to re-evaluate how that person has changed -- or how my perception of him has changed -- and how I'm going to deal with him from moment to moment now that I have this new information. 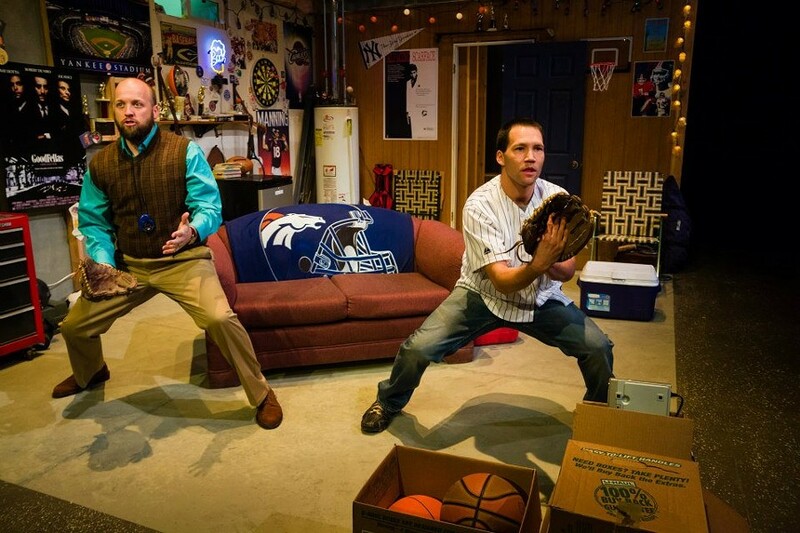 A two-man show is like chess -- how many tactics and moves do you have? Lanny: Tracy Callahan has been great as a director, and I’ve felt like I was in good hands from day one. In the first rehearsals, Jesse and I were already working off-book, so we were able to really hit the ground running. Tracy has been a wizard at harnessing our very different energies and quirks, and meshing them together in some really funny ways, so I think the production going into opening night is in a fantastic place. I’m especially excited to get to perform this play for the always-adventurous SLAC crowd. It’s a new script, so they’ll get the experience of seeing a brand-new play, as well as the opportunity to go along with Jesse and I on our journey of discovering what it means to be a father, a husband and a man. In a state like Utah, where issues of family and parenthood are a little more central to everyday life, I think this play will hit home for a lot of people. Tracy: Not sure what I will be directing this spring, but next year I will be working on a new script with a local playwright at Weber State with a group of my students. I have really enjoyed working with new plays lately. Perry: My next local project is as part of the cast for A Night With The Family by Matthew Ivan Bennett. 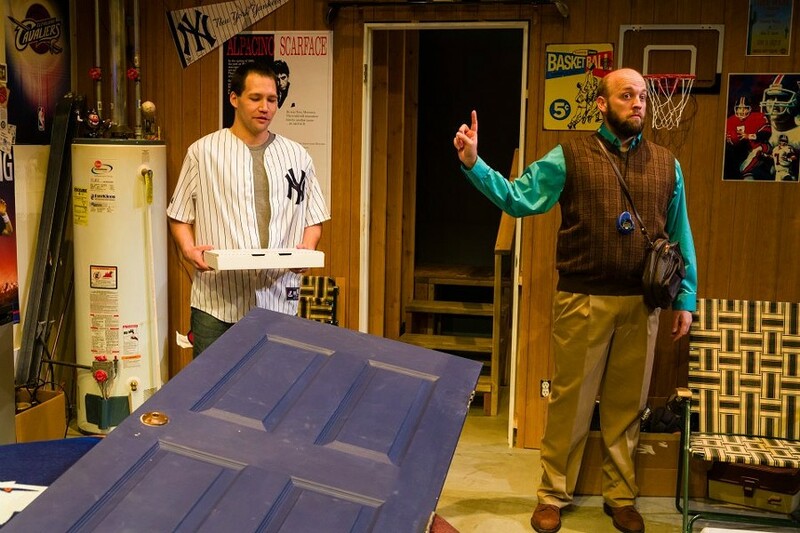 It's Pygmalion Theatre Company's hilarious spring show. Lanny: I just moved here, so, hopefully, I’ll be able to continue to work professionally. So far, it is going great! There are a lot of companies in the valley that I hope to get the chance to work with, but there’s a chance I may end up in Minneapolis next summer, so this may be my one big hurrah in the Salt Lake theater scene before taking off next summer. I hope to get to come back to SLAC someday; it’s been a superb opportunity. Lanny: I’ve occasionally worked as a director, so if anyone sees the show and thinks they might like to work with me in that regard, I’d love to hear from them!